I entered my Ranger Conversion, AKA EPT2 (Electric Pickup Truck Two) in the car show at Cypress Gardens on Sunday, October 26. This show has little to do with EVs or the environment, but for me is an opportunity to expose people to the possibility of driving electric. This is my second car show at Cypress Gardens. The fist was last May on Memorial Day weekend. There were lots of opportunities to educate the public about EVs using my vehicle as an example but emphasizing the importance of the RAV4-EV in recent EV history. My wife and I were kept occupied by a constant stream of attendees. She is quite a knowledgeable supporter and is able to pitch in when we are approached by two or three attendees at a time. This community of auto enthusiasts has been very supportive of me and my vehicle. 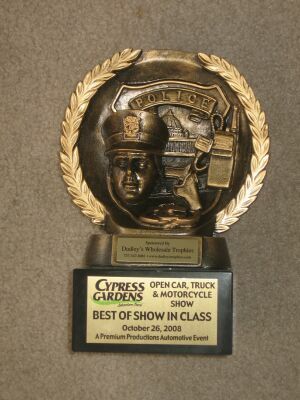 EPT2 won its second award at this event, "Best of show in class". The first was at the May event.